‘Adam London at the D,’ a great new Las Vegas Comedy Magic show. Born and raised in Ogden City, Utah, Adam London has carefully honed his craft in comedy clubs and other venues across the country and is a skilled comedian as well as a talented magician. His biggest asset though, is the fact that he is a genuinely likeable person who is obviously thoroughly enjoying what he does. He radiates a simple and genuine quality that transforms his act into something rather special. Audiences warm to London within a few seconds of his walking out onstage, and in a city where you can scarcely throw a deck of cards without hitting a magician this counts for a heck of a lot. 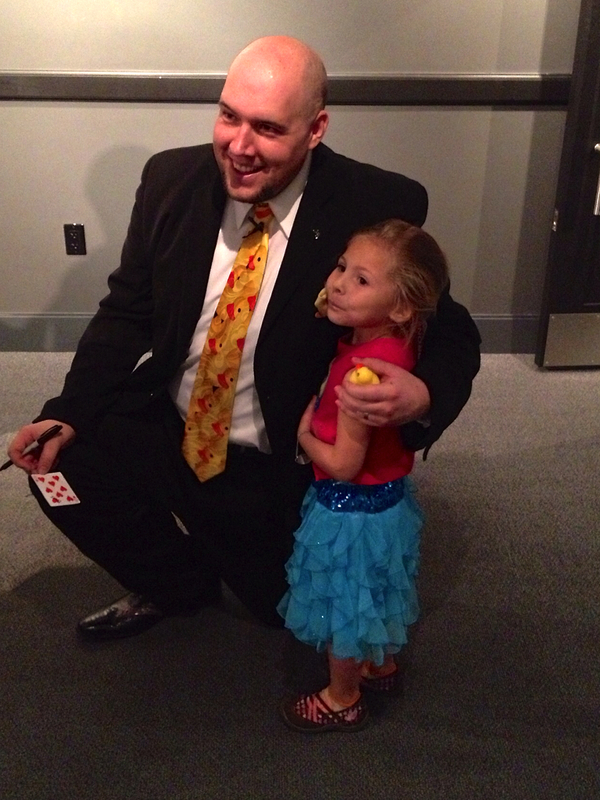 It is amazing how many of those magicians forget to charm their audience as well as fool them. There is plenty of bite in Adam’s comedy too, don’t let me paint an incomplete portrait. You didn’t get soft or mushy working in comedy clubs, and there is a pleasant amount of edge behind his quirky combination of jokes and tricks. When I saw the show, there were quite a few youngsters in the crowd, and they were really enjoying what was going on; and so were the adults with them. This is my idea of a real family show. The 60-minute show moved along effortlessly and held the attention of everyone present. From the pre-show video ‘till the closing trick, things never got dull for a second. London opens his show with some great observational comedy about himself and his background. The crowd enjoyed the slightly askew element that arose from his good-natured jokes about his Mormon roots. It also set up some great future callbacks for the comedy in his show. There was excellent use of music cues and sound effects to heighten the comedy. The (sort of) theme of the show revolves, in a slightly hazy manner, around London’s love of those little yellow rubber ducks that kids like to float in their bathtubs, or throw hoops around at carnivals. Hey, I’m just telling you the theme of the show, not trying to explain it! The only way to fully grasp it is to see the show—and you might not succeed in getting it too straight even then. London is a published author of a popular children’s book about the adventures of one of these plastic ducks, maybe it all makes more sense if you’ve read the book. There was a line of youngsters after the show who were delightedly waiting for Adam to sign their copies, he was also signing $1 rubber ducks as souvenirs. Mostly the kids just seemed to want to spend a few minutes talking with London, who was gracious and generous with his time. The magic in the show varied from a very strong handling of the ‘Tossed Deck’ and the ‘Hydrostatic Glass,’ to a truly surreal segment where he draw a characterture on a board and sang a spirited duet with it as it came to life. He also performs a unique version of a destroyed and restored ring in M & M package. 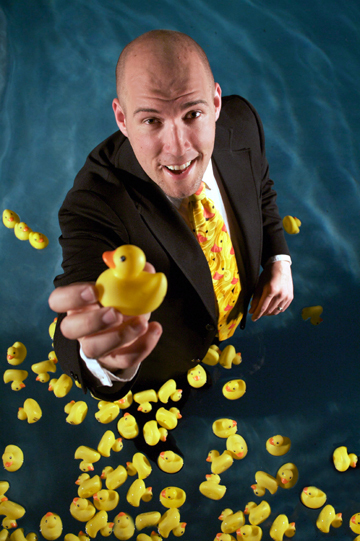 Oh, and did I mention there were rubber ducks! Over the years I have become rather jaded watching comedy magic—heck I’ve made a living doing it for over 40 years, but I found the show fresh and funny. Is there room for the show to get a little tighter and more focused? You bet there is, and I have no doubt that it is doing so day by day. This is a smart performer with a great career ahead of him and I strongly suggest if you are visiting Las Vegas you head down to the ‘D’ and catch the comedy and magic of Adam London. ~ by Nick Lewin on April 11, 2013.